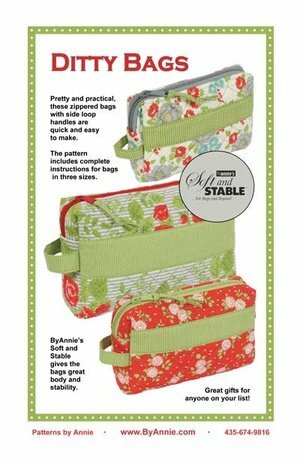 Pretty and practical, these zippered bags with side loop handles are quick and easy to make. Add a clear vinyl lining for an easy-to-clean cosmetics bag. Small (6½”W x 4”H x 1½”D): This smart case will carry your most important beauty supplies or other items and will fit easily in most purses or bags. Medium (8”W x 4½”H x 2½”D): Not too small and not too big, this bag fits neatly into a larger purse or your favorite tote and can carry and protect a multitude of supplies. Large (10”W x 6"H x 3”D): For more than the basics, this large and spacious case holds bottles, brushes and more. Use it to organize a diaper bag or make it in more masculine fabrics for a great guy’s toiletries bag. Pattern Required.